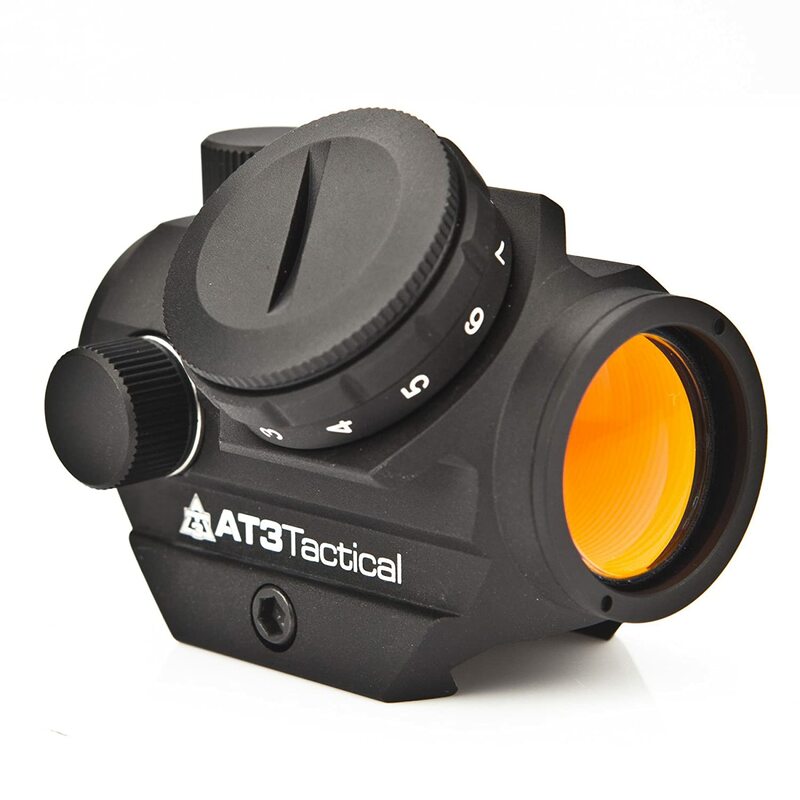 The RD-50 red dot sight by AT3 tactical that’s optimized for the AR system. While it’s optimized for this rifle, it’s not uncommon to see it on shotguns, handguns, hunting rifles, or any other weapon with a Picatinny or Weaver rail system. It will come in three different sizes depending on the type of mount you want (none, mid, and high). One neat aspect of this sight is its battery life, able to support close to 50,000 hours of use (on the lowest setting besides “off”) before the CR2 battery is drained. Turning the dial to zero will shut off the sight completely. The sight is constructed to eliminate parallax, meaning that whichever way your eyes move, the red dot will remain in the center. The RD-50 is definitely on the cheaper side of the red dot sights. There are sights by Vortex and Aimpoint that can range in the hundreds of dollars while the high mount version of the RD-50 still sits below a hundred dollars. This sight’s dot is overall larger than ones we’ve seen. While most sights give the handler the ability to adjust the brightness, the size of the dot is also imperative. A dot that is too big or too small basically eliminates the effectiveness of the sight. The lens cap is also detachable, which seems minuscule in importance, but some sight’s lens covers flap around when you’re moving around or have the gun in a different position other than straight ahead. Don’t let the cheapness of the product distort the RD-50’s usefulness as a sight. We like that the RD-50’s stacks up nicely against the most expensive of red dot sights and has no visible or clear drawbacks. The one thing to keep note of is the brightness levels. This is the sight’s on and off switch, as there is no automatic shutoff as with more top of the line products. However, even on the lowest setting, you’re able to get thousands of hours worth of life before even changing the battery. Click here to shop the RD-50 Red Dot Sight.